We’d love your help. Let us know what’s wrong with this preview of The Game of Love and Death by Martha Brockenbrough. Antony and Cleopatra. Helen of Troy and Paris. Romeo and Juliet. And now... Henry and Flora. Meet Antony and Cleopatra. Helen of Troy and Paris. Romeo and Juliet. And now... Henry and Flora. To ask other readers questions about The Game of Love and Death, please sign up. Is this book YA or Adult? Also, how good would you say it is? Really looking forward to it, based on the synopsis! Is this book narrated by Love/Death, or the main characters? In life, there are times when you meet someone and realize "there's just something about them". Maybe you know what I mean. Those people who may not be the best-looking, not even your usual type, not the smartest, the funniest or the "best" at anything really... but, for some reason, you're drawn towards them. And it's wonderful. You don't have to be a romantic to think there's something incredible about being pulled towards someone by some strange unseen force - God? Fate? The very chemistry of the universe? How wonderful to think your bond with someone goes beyond the physical and the rational. I understand that. And yet... it doesn't work for me in books. Or, at least, it never has yet. Perhaps it's because this feeling that warrants a "there's just something about him/her" is very personal to the one experiencing it. That's the beauty of it, right? That no one else really gets it. But, as the reader of a romance novel, I kind of need to get it. If I want to fall in love with a couple, I need to feel the chemistry between them. I need to love them too. And that's why instalove never works for me. "There's just something about him/her" never works for me. For me, ineffable emotions don't work in novels when all I have are the words before me. I appreciate in real life there are times when you can't describe how you feel with words; but, in books, being unable to describe something with words is kind of a big problem. Or, not even describe, but SHOW. No need to tell me how you feel, it's even better if you show me through character experiences, dialogue and the details between them. This book has an interesting premise. It's historical with a fantasy aspect and in this story "Love" and "Death" are actual beings who select players in a millennia-old game. In the past, Death has always won, but can Love finally prevail when it comes to Henry and Flora? The best bits about this book are the 1930s setting and the subtle explorations of race and homosexuality going on in the background. Henry is a wealthy white boy with a college scholarship and little to worry about, even though this is Depression-era America. Flora is a black girl who sings in jazz clubs by night, hoping to one day become the next Amelia Earhart. And then there's Ethan, a boy struggling to come to terms with his sexuality in a society that would never accept him. The little subplots were excellent, though sadly overshadowed by the "Game". Not only that, but people do an awful lot of "sensing" in this book. I've said in the past that I find this kind of storytelling lazy - when the characters either do or don't do something because they "get a feeling" about it. Like not trusting the bad guy because they "have a bad feeling". It's lazy and I don't buy into it. All this being said, the author writes some beautiful descriptions of 1930s Seattle and the jazz scene. Plus, the subplots about race and sexuality were handled in a sensitive and engaging way. If the author branches off from destiny-inspired romance in her future books, I might come back to her work. She whispered this into the baby’s ear: Someday, everyone you love will die. Everything you love will crumble to ruin. This is the price of life. This is the price of love. It is the only ending for every true story. I hardly ever read historical fiction. We all have our favourite genres, mine being fantasy, LGBT and romance and, believe it or not, this book combined all three of them and dispersed them on its 1937 setting. What a fantastic result! There’s a game being played, the ga 3 1/2 stars. There’s a game being played, the game of Love and Death, Love and Death being the judges. The players are Henry Bishop, from a high-classed respected family and Flora Saudade, African-American whose dream is unlike any you might think; she wishes to fly above the oceans, be free and not let anyone or anything keep her from becoming an aviator as great as Amelia Earhart. Of course Ethan was focused on the plane and the assignment. He never let himself get distracted by girls. Never. Henry tried not to, but without much luck. He was forever looking at them, forever looking for the one who’d make him feel as if he’d met his other half. He’d yearned for it his entire life, not that he could talk to anyone about it. Henry is the type of guy any girl would fall deeply in love with. Gentle, attentive, passionate and true, he isn’t afraid to follow his heart and… will make you swoon. How can one resist someone saying fervent things like, ‘‘If it’s us versus the world, my money’s on us.’’ I know I couldn’t. Flora is one hell of a lucky girl. And they’re meant for each other. But when a whole society doesn’t approve of the one you love, what do you do? There are plenty of characters to keep you interested in the story, such as Henry, Flora, Love, Death, Ethan, Helen and a multitude of secondary ones. It was quite entertaining to see Love and Death mingle with our two lovely main protagonists. Also, while I completely despised Death in the first chapters, she… grew on me. There is more about her than what she lets others see. The author made of Flora an inspiring and strong human being. She loses so much, yet she remains courageous and perseveres in order to fulfill her dream. I actually only have two complaints for the whole novel. First, the last hundred pages could have been reduced to fifty or less and, second, Ethan’s character disappeared too unexpectedly and rushedly. It saddened me to see him being expulsed of the story in such a way. Brilliantly-written, The Game of Love and Death will touch the heart of many. This was just PERFECTION and SO MANY FEELS. I accidentally shipped Love and Death as an OTP (what?!? These things happen) and it's one of the most gorgeously wonderfully written stories of ever. It was like The Book Thief meets Code Name Verity and I could SCREECH BECAUSE THAT'S SO BEAUTIFUL. It's set in 1930s and it's basically about Henry (who is white) and Flora (who is black) and how Love and Death have this game to see if they could fall in love. Basically Love is an immensely passionate sh This was just PERFECTION and SO MANY FEELS. I accidentally shipped Love and Death as an OTP (what?!? These things happen) and it's one of the most gorgeously wonderfully written stories of ever. It was like The Book Thief meets Code Name Verity and I could SCREECH BECAUSE THAT'S SO BEAUTIFUL. It's set in 1930s and it's basically about Henry (who is white) and Flora (who is black) and how Love and Death have this game to see if they could fall in love. Basically Love is an immensely passionate shipper of all the things. I SHIP ALL THE THINGS. Omg, this really brings out my shipping side. So, like in The Book Thief, Love and Death are like immortal beings. They're personified and OMG HAVE I MENTIONED HOW MUCH I FREAKING LOVE THAT?!?! Love is the dude, and and Death is the girl and I also loved that twist, because I guess, usually, it's the other way around?! So Death is all sassy and sharp and dark and dangerous. And Love is this big softie of melting caramel goodness. They have quite a few meetings and it's sad and it's BEAUTIFUL and yeah. I ship them. Don't comment on how weird that is. And I looove books about games. Particularly immortal/fantasy/magical games like this. If Flora and Henry don't get together: ONE OF THEM DIES. BOOM. And they don't even know the stakes of their own game. AWK. And of course they're entirely adorable together. And they TOTALLY aren't falling in love easily. They're kind of instantly attracted, but basically go out of their way to avoid each other. And, considering the difference in skin colour, they've got to fight all this prejudice and racism. UGH, the racism made me sick. Since it's the 1930s, it's definitely in there and arghhhh, I just got so mad at it all. ANYWAY. There's also a secondary character LGBT romance (!!) which was just as difficult as Flora/Henry's biracial romance. SO YEAH. I loved how the book really addressed the difficulty of being who you are even if the world disapproves. Although, to be honest...there were a few things my eyeball twitched at. Particularly the ending. I do NOT think one of the plot-points leading to the ending was realistic (just that (view spoiler)[ Henry and Flora believed in the game so easily. I mean, really!?!? Why would they?! And also how Ethan just exited to the navy...I felt that was a thread left hanging. I SHIPPED HIM WITH LOVE, DAMMIT. GET THEM TOGETHER AGAIN. (hide spoiler)]) But in the scheme of things?!? IT totally didn't lessen my affction for the book. OH. And I found it kind of slow to read. Not as in "this-is-boring-omg-I-need-to-nap" just in the "I-want-to-get-every-detail-of-this-beautifully-written-book" and I really had to focus and read slowly. So I don't think it's a book you can whip through. Basically I really REALLY REALLY loved it. HAVE I MENTIONED THAT LATELY!?! Omg. I loved the tragedy and the beautifulness and the ending gave me goosebumps. And I loved all the secondary characters, and I adored how passionate and quietly determined Henry was. He just loved Flora. HE LOVED HER. And even if she was in denial of her feelings for so long....gah. *ships aggressively* I love how all the characters are strong and interesting and dimensional (ALL of them! Even the secondary ones). I loved how Flora wanted to be a pilot and Henry played music. YEAH THIS BOOK IS FABULOUS. And lovely and deathly. The Game of Love and Death is positively packed with particulars to ponder. Love is a man, Death a woman. Each chooses a competitor, a term I use loosely; the chosen do not actually compete. Most people are unaware of the Game, even while participating. Virtually no rules, a victor is declared; but the win seems superfluous. Flora, an amazing aviation mechanic, is also a phenomenal pilot, possibly rivaling Amelia Earhart. It is 1937 and she “has the brown skin, and here in America, (you) pay so The Game of Love and Death is positively packed with particulars to ponder. Love is a man, Death a woman. Each chooses a competitor, a term I use loosely; the chosen do not actually compete. Most people are unaware of the Game, even while participating. Virtually no rules, a victor is declared; but the win seems superfluous. Henry hasn’t had it easy, but he is a white male. His dream is simple: eke out a living with his beloved bass. Instead, he works for the newspaper of his almost-adopted family, often accompanying Ethan on interviews. When Henry sees Flora working on a plane, it is as if he had been sleep-walking through life and is just now completely awake. The harrowing story of Flora and Henry in the Game between Love and Death is enriched by the secondary characters. Ethan isn’t the golden boy he seems, and his secret struggles would tarnish his image if revealed; although there is nothing to be ashamed of. Simple spoken statements throughout, “there hasn’t been a white newspaper that’s written about the likes of us unless some sort of arrest was involved,” reiterate bigoted opinions; making the book more than just entertaining to thought-provoking, too. Lovely fairy-tale fitting language, but so many missed opportunities - the rules of the "game" are very vague and unclear, romance that is not-so-epic, lacking in historic accuracy. Quite interesting perspectives of Love and Death though. So I’m sort of off goodreads, but I made an exception just so I could talk about this book. BECAUSE GUYS, THIS BOOK. I want to live and love and die in its pages. There is so much to love in this book. AND I LOVE IT ALL. Planes and jazz and Seattle and 1930s and tax evasion and undercover journalism and true love and true death and Amelia Earhart and cornbread and historically accurate race relations and sexuality and Venice and baseball and every kind of love and I’m sort of incoherently infatua So I’m sort of off goodreads, but I made an exception just so I could talk about this book. There is so much to love in this book. AND I LOVE IT ALL. Planes and jazz and Seattle and 1930s and tax evasion and undercover journalism and true love and true death and Amelia Earhart and cornbread and historically accurate race relations and sexuality and Venice and baseball and every kind of love and I’m sort of incoherently infatuated with it. Flora and Henry are now in my fleet of ships, challenged only by Ethan and James because Holy Mary that broke my heart in half. This book is such a beautiful examination, without ever being heavy handed, of what it means to love and what it means to live, and how the two become intertwined. It is about sacrifice, and the things we think we want and the things we actually want and what we sacrifice for those things. Also the writing will leave you breathless and swooning. If jazz music were words, it would be this writing. Nontraditional and innovative and sensory and evocative and it just wraps you up and holds you. I am in love with this book, everyone. This is one of those books that I don't want to say too much about because I'd rather you picked it up and read it for yourself. I will only say that it is a smart, beautiful book that will stay with me for a long time. It's lovely and heartbreaking and you should just go read it now. Just make sure you have tissues readily available. Had any human eyes been on them that moment, they would have seen what looked like a couple in love standing beneath a sky pinned in place by a fishook moon. The first I heard of this book was at the Scholastic Blogger Brunch, I was instantly intrigued and eager to read it. I was fascinated by the idea of Love and Death battling for centuries, in a game where death always wins. I wanted to meet these two characters, see what motivated them to play their game, especially Love who was playing a game he had always lost. Love and Death choose their players, and this is where Henry and Flora enter. The game is simple, for Love to win, the two must choose each other over the cost of everything else. If they don't, Death wins, and that will not bode well for either of them. When I was offered the chance to review this book I jumped at it. It seemed like it was going to be such a wonderfully unique read and unlike anything I had really read before. And yet it also seemed to have elements to the story that reminded me of other books I had read and absolutely loved. I started the book with a little trepidation, I was excited but had really high hopes and really didn't want to end up disappointed. I am so pleased that I can say that this has been one of my top reads of the year so far, maybe even THE top read of the year so far. And I will start my review by apologising, I have no doubt that this will be a gushy, fangirling type review - I will spew words of love and beg you all to read it. So, if you were hoping for a well written, wonderfully articulated review, look away now! We do not choose whom we love... We can only choose how well. I can't do my usual review routine, where I discuss all the things I loved about a book, before opening up about the things I didn't like or vice versa. Finding even one little fault or issue I had with this book is actually impossible. To me, this book was utterly perfect and I couldn't have asked for more. It contains everything I could need or want from a story - unforgettable and diverse characters, a fantastic plot, beautiful romance, LGBT themes that are handled better than I have seen in a long time. Martha Brocknbrough has truly blown me away with this book and guaranteed I will be hunting down more of her work, whilst eagerly anticipating whatever she releases next. This same system could condemn injustice, but instead it chooses to condemn something as simple and fundamental as the search for the second half. We are all born wanting this. Why does it matter what shape this second half takes, provided it is the thing that both sides seek. I adored the whole cast of characters in this book. Flora sings in a jazz club, but it's not what she wants to do with her life. She dreams of being the next Amelia Earhert but, although she is an exceptional pilot, being African-American during 1937 sees Flora living in a time where her skin colour holds her back. Flora is a resilient, strong and inspiring character who suffers through so much, but never allows it to stop her. I admired her so much and she quickly became one of my favourite heroine, and I don't see her ever getting knocked off that list. Why choose fear over love? In what world does that make sense? Henry has lived with the Thorns ever since he lost his family as a child, Mr Thorn was a friend of his father. The Thorns son, Ethan, is Henry's closest friend and they work together on stories for Ethan's fathers paper. Henry was just such a wonderful character, the kind of guy that any girl would be lucky to fall in love with - sweet, romantic and someone who cares deeply. And Ethan is a character dealing with feelings that are seen as unnatural and unacceptable in the times. There were moments where Ethan's hate for himself and everything he is but can't control had me in tears. It was exceptionally written and would strike close to home for anyone who has tried denying their true self just to please others. 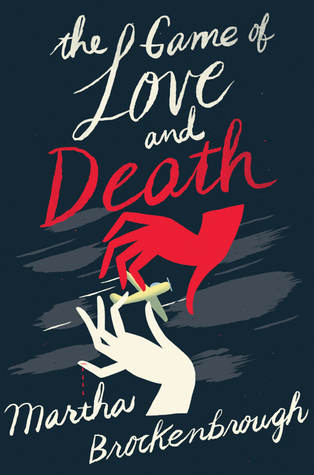 I can't do this review without mentioning the fantastic personified versions of Love and Death. I went into this wrongly assuming that Death would be male and Love female. I don't know why, I think it's from other well known personifications I know where that had been the case. I was surprised but delighted that Brockenbrough didn't go down that route. The interactions between these two were fascinating to me, the two have centuries worth of back story and I would probably give up by first born - sorry, future first born! - in order to get a prequel story about those two. If life didn't end...there would be no need for me. To choose love in the face of death is the ultimate act of courage. I am the joy, but you are the meaning. Together, we make humanity more than it otherwise might have been. This book offered up so much more than I could ever had expected when I first picked it up, clearly I had underestimated the book. There's honestly no better word to describe this book than beautiful - it was completely and utterly beautiful. A unique story that made me feel utter joy one moment, brought tears to my eyes the next, and had me unable to put the book down. This is a story that will enchant you and have you unable to pull yourself out of the story or away from the characters. You will come to truly care for Henry and Flora, as if they were two of your closest friends and you can't bear to see them not end up happy. It's always fantastic to find a book that has diverse character or deals with LGBTQ issues, so it delighted me to find out that this book tackles both. This book not only has a historical setting, a fantasy element and a romance, it also has diverse characters AND explores LGBTQ themes and how these were viewed back in the 1930s. These different elements came together to make up one beautifully layered story. Brockenbrough explores the issues of race and being LGBTQ in the 1930s, whilst also making it obvious that we've come far now, but maybe not far enough. Watching characters struggle with who they are, and how people treat them for who they are as a person near enough broke my heart when I was reading this book. This is a book that has people proclaiming that if you loved The Book Thief then you will love this. It's one of those types of recommendations that I hate, but here it's entirely justified and entirely deserved. This book made me feel so many emotions, it had me joyful one moment and heartbroken the next. It broke my heart and yet filled it up at the same time, just the way that The Book Thief had when I read that. If I could only get my readers to read one book this year then this would be it. Not only because it's an exceptionally amazing piece of YA fiction, but also because it deserves so much more recognition and praise. To be written into story. That was how even the lost lived on. The Game of Love and Death is an exquisite story that I feel everyone should have the pleasure of reading. It made me sad, angry, hopeful, happy and everything above, beyond and in-between. I fell in love with the unique and individual characters, whose lives I came so wrapped up in that I felt far too heavily invested when I actually remembered they were fictional - they never felt it though. Brockenbrough brought her characters to life in a way that few authors can. I will be rereading this book for years to come, this is a story I will want to find myself getting lost in over and over again. This is a book to make you think and to make you feel, to make you question and look for answers. I couldn't recommend this enough and, even if you hate it, I'd love to hear your thoughts, if and when you get to experience the story for yourself. *I received a copy of this book from Scholastic in exchange for an honest review. An ARC of this title was provided by the publisher in exchange for an honest review. My thoughts are my own. This review (and a giveaway thru 5/4!) can also be found at The Starry-Eyed Revue. The Game of Love and Death was absolutely exquisite. It was eloquent and beautiful, and you can't help but be pulled into the love story of Henry and Flora. But this story wasn't just about the romance; there's also a lesson or two in there about overcoming fear, among other things. "Death is the finest teacher. The finest, and the most cruel." The book itself was incredibly atmospheric, set in 1937 after the Great Depression, when practically everyone but the rich white male was oppressed in some way or another. I found the depictions of life in this time period to be beautiful -- if not heartbreaking -- in their portrayal, and it all felt authentic based on what I know of the period from history texts and stories from my own grandparents. The inclusion of music as a common interest between the players but also as the soul-searing source of their bond was a brilliant touch. I was completely engrossed as the game unfolded, and as the details of the game -- and some from previous games -- were revealed, I found myself drawn as much to the characters of Love and Death as I was to the players. They were so enigmatic and yet I felt I knew the truth of them from the very first page. But it was Henry and Flora's souls that captured my heart. Okay, and maybe Ethan's, too, for he stole my heart more completely with every page turned. None of them had an easy go of it, especially considering the times and what was considered taboo in those days. And taboo is probably putting it a little too mildly. "But what were odds? The odds against any one human being born were tremendous. The chain of moments that led to it was long, a chain made of infinite human choices that each had to occur in sequence to lead to a particular birth. The odds of either Flora or Henry being here at all were one in four hundred trillion, give or take." I came to love these characters and longed for them to beat Love and Death at their own game. Still, I never really felt that connection to the characters, that certain something that means I am 100% invested in the story. I knew them. And I would want to know them in real life. But the only time I felt that emotional pull toward them was when they were on the page together. Their chemistry was palpable, even when it was the lightest, most innocent of touches bringing it out of them. Yet, I felt a lot like Flora must have throughout the story: there and in the moment and yet not a part of it. This story was gorgeous in execution and brilliantly told, the kind of love story that you can get swept away in without risking too much. Love and Death's past is haunting and slightly horrifying, and Henry and Flora's future is bleak, and yet the story as a whole is just so achingly beautiful. And terribly romantic. It's not just the story of two people falling in love but one of overcoming the odds and conquering fear. In a word: exquisite. Alternates point of views between the two lovers while Love and Death are playing their game.. This is how it all starts. They choose their players and by cheating or influencing the people in their players lives do they get to win. Which one will win and which one will lose? Here we have Love and Death as people who shapeshift into others and by doing so they influence this game they play to win. While Love is good and ultimately wants everyone to be happy, he is a worthy opponent. Death on the Alternates point of views between the two lovers while Love and Death are playing their game.. This is how it all starts. They choose their players and by cheating or influencing the people in their players lives do they get to win. Which one will win and which one will lose? Here we have Love and Death as people who shapeshift into others and by doing so they influence this game they play to win. While Love is good and ultimately wants everyone to be happy, he is a worthy opponent. Death on the other hand is cunning and deceitful. I loved how creative this book was and not only did it have a wonderful storyline, it had such flawed characters. Both of the main characters aren't perfect and you see how their lives were shaped by Love and Death from the very beginning. I loved seeing the slow decline as I kept reading on. Poor Flora just wants to be a pilot but she's African American and also a woman. I love how determined she is to be someone, to be one of the first, and how her love for flying got her through her life. Henry is a sweet boy, who is ultimately trying to be a good person even though he isn't perfect. He's loyal and kind and I admire him for not letting anyone get in the way. It was so hard just having them perform together that if they ended up being a couple in public health would prove to be dangerous to their livelihoods. Even Ethan was a great side character, and he was battling with his feelings for his very own self. It felt so raw and real that I wanted to finish the book as soon as I could. One underrated love story between a Caucasian and an African American set in a time where it was dangerous to fall in love, The Game of Love and Death will have you rooting for both sides of the chessboard. Pick it up if you're looking for a unique historical romance with a little bit of magic thrown in. If God didn't want me to fly, why on earth would God have made me want to fly so much? Love was nothing you could see or touch. It lived entirely inside of you, invisibly. The one you've been looking for. One who is here. One who sees you. One who is able to love you just as you are. Every last one of us is going to die, but if we don't live as we truly want, if we're not with the one we want to be with, we're dead already. Everything separates us. You can go where you want. Do what you want. Eat where you want. The world belongs to you and yours. My kind, we're here to be your mules. Your world rests on our backs. If it's us versus the world, my money's on us. What we create must be something that we love. That's how we know it's true. We do not choose whom we love. We can only choose how well. Had I read my friends' reviews a little more carefully, I probably would've steered clear of this YA romance, not necessarily because of the romantic elements, but because of the fantastical nature of the romance. For Henry and Flora, an ill-fated mixed race couple in the 1930's, are under the thrall of Love and Death, two shape-shifting immortals who choose Henry and Flora as babies to be unknowing participants in a game (as immortals are wont to to play). If Henry and Flora fall in love with each other, Love wins; if not, Death wins, and in winning can feed upon the pairs' souls. Love and Death are playing the Game, their players being Henry Bishop and Flora Saudade and supporting players being Ethan, Annabel, Helen and James. So far Death has always won. Always. This time, 1937, Love again hopes to win having learned from the past and determined to make his own rules, just like Death. Henry is a white, wealthy and is looking forward to a life full of opportunities meanwhile Flora is African-American who dreams of flying and sings in jazz clubs. It was a nice read, I supp Love and Death are playing the Game, their players being Henry Bishop and Flora Saudade and supporting players being Ethan, Annabel, Helen and James. So far Death has always won. Always. It was a nice read, I suppose, but after a few days I realised that "nice" was just about all I could say. The execution of the idea did not live up to the premise. I would not dare calling it historical fiction because everything historical about it was pretty much in the background. The emphasis was on the romance, or rather the insta-love between Henry and Flora. Excuse me, but the "there is something about him/her" and "he/she cannot take her/his eyes from..." does not work for me. I stopped buying this story quite a while ago. Besides, I am not very fond of romance, let alone cliché romance (one of the reasons why the only play by Shakespeare that I don't like is Romeo & Juliet) thus, both Henry's and Flora's behaviour was something that often annoyed me, especially in the second half of the book. I've encountered such characters in dozens of books, their reactions and thoughts and most importantly their angst and tortured feeling are always the same. There is nothing new, nothing particularly striking about them. I didn't see why either Flora or Henry were something special. Somehow, all characters sensed stuff rather than thinking logically. Premonitions are certainly nice, but if they occur excessively they seem rather useless to me. The author should have included a bit more logic rather than "sensing". And before I move to the positive aspects, one thing - Love and Death. I really looked forward to them. But it seems doubtful to me that after all the other players who were certainly legendary it would be Henry and Flora who would help Love and Death, especially Death, realise the obvious. The conclusion, resolve, call it however you want, was not satisfying. By means of it the author humanised both beings, which I think was a mistake. How did these two spend their millenias when not playing the Game? Did they never stop and think? This did not make sense to me. How Love and Death could be so blind and naive in their emotions and struggles, more naive than human beings even??? Am I the only one who thinks that there was something not right about it? What was pleasant about this book was first and foremost the writing. The writing was both beautiful and captivating. The way passages were connected, the descriptions of Love and Death and their thoughts and activities was amazing. The bits about 1930s although there were rather few of them, the historical background and the conflicts of the given time were highly intriguing. I wish there would have been more of the time and the people, even of Flora's passion for flying. There could have been so much more if the author hadn't put the Game first. Another aspect I enjoyed reading about was the exploration of race and racial conflicts which the main characters barely dealt with. Even that was somewhere in the background though it should have been one of the main problems given the time. And of course the aspect of homosexuality, the struggle with acceptance and society's opinion about it. All these subplots were splendid, they left me craving for more, but the author did not explore them any further and well, they were just subplots. Due to the writing, the secondary characters and the interesting subplots I ended up liking this book, I'd even recommend it to those who enjoy romance and star-crossed lovers, but I know I will not come back to this book again. It was just really beautifully executed. The writing was flawless, the characters were all brilliant and had depth, and I didn't know how it was going to end. I'm putting this aside for the time being and since I didn't properly finish it, I didn't feel I should give it a rating. Based on the bit I did read, I do think that the author has a great premise with this book. "Someday, everyone you love will die. Everything you love will crumble to ruin. This is the price of life. This is the price of love. It is the only ending for every true story." It begins in March of 1937. It's about a game, played by Love and Death over the course of centuries. They choose their players, they set their rules, they roll their dice to set a time frame and then they stay close by, ready to influence in any way they can. Death has always won. This book asks if there can ever be one place, time and pair that can make love prevail. Our MC's are Flora, an African American 17 year old girl who dreams of becoming a pilot. At nights, she sings in a jazz club run by her uncle. Then we have 17 year old Henry. Born just a few blocks away from Flora, but it might as well be a whole different planet. He is white, taken in by a wealthy adoptive family in the midst of the Great Depression. His whole future is set before him. We also have Henry's best friend/adoptive brother Ethan, who I have a strong feeling may have a secret of his own (a lot of hints about him possibly not being into girls dropped very early on). So, great premise. I like that the author chose an interracial couple for this particular time period. That alone I would think would be the dilemma in their relationship that they must overcome, since in the early 20th century it was still very much ostracized. Same with Ethan's 'secret'...it's something that back then just wasn't accepted. I skipped most of the book, because nothing was happening. I really liked the idea of the book but it just wasn't my cup of tea. Love and Death are old friends and nemeses, locked in an eternal battle. One night in 1920, the two decide to play another round of their game. Each picks a young baby as their player. Love chooses Henry; Death chooses Flora. If when the two grow to adulthood they choose each other at the cost of everything else, Love wins; if they do not before a certain amount of time elapses, Death wins, and she can claim Flora's life. Henry and Flora couldn't be more different. Henry, a young white boy, is ra Love and Death are old friends and nemeses, locked in an eternal battle. One night in 1920, the two decide to play another round of their game. Each picks a young baby as their player. Love chooses Henry; Death chooses Flora. If when the two grow to adulthood they choose each other at the cost of everything else, Love wins; if they do not before a certain amount of time elapses, Death wins, and she can claim Flora's life. Henry and Flora couldn't be more different. Henry, a young white boy, is raised by the wealthy family of his best friend. He is smart, musically talented, and thirsting for something he can't name. Until he meets Flora, an African American girl raised by her grandmother. She dropped out of school to help run the jazz club her parents once owned, but she dreams of being a pilot like Amelia Earhart. "He was...forever looking for the one who'd make him feel as if he'd met his other half. He'd yearned for it his entire life, not that he could talk to anyone about it. And this girl ... there was this ... quality about her, something so alive." Henry becomes obsessed with Flora, more so when he hears her sing. And although she feels a certain inexplicable pull each time she sees Henry, Flora doesn't want to sacrifice her dreams of flight for anyone or anything. But more than that, she knows how an interracial romance in 1937 Seattle could rock both of their worlds and the society around them, although Henry is willing to risk everything—the possibility of an education, the love of his surrogate family, a future—just to be with Flora. As the couple drifts toward and away from each other, Love and Death manipulate the situation as much as possible to get their desired outcome. In the meantime, the world around them is battling poverty, racism, and corruption, as those they care about fight their own battles as well. Who will win in the end, Love or Death? Will this be a love story for the ages, or one destroyed by the same old hurts and slights? I thought this was a tremendously fascinating concept for a book. Henry and Flora's characters really fascinated me, how one gave into love so readily and one fought it every step of the way as a protective measure. Some of the supporting characters, particularly Henry's best friend Ethan, were really well-drawn, too. My challenge with this book is that for the most part the same thing happens, over and over again. While I, well, loved Love's character, Death really frustrated me. (Truer words have never been spoken, you know?) She was just too manipulative and honestly reminded me of a villain from a crime novel, who always seemed to be hiding just around the corner from where something good happened, or always seemed to be one step ahead, and I found that really frustrating. I understood the point, but it really dampened my enjoyment of the story. Even with that, however, I was dazzled by Martha Brockenbrough's writing ability. Her use of language and imagery was mesmerizing; I really could see so much of the book as if it were on a movie screen in front of me, and that doesn't always happen when I read books. It really helped elevate the story and kept me reading. I also really liked the way she treated concepts like homosexuality in the book, especially given the time frame during which the book was set. I'm loving the fact that several of the books I've read so far this year have started from really unique ideas. That bodes well, I think, for a fantastic year of reading! The Game of Love and Death is perilous indeed. This is one where I shouldn’t reveal too much of how the book unfolds as it is best left to the reader to discover all of the mysteries and intricacies on their own. At its core this novel is a reflection on love, and loving, and life. On what it means to love, and what it means to love in the face of overwhelming obstacles. This is the story of Flora Saudade and Henry Bishop. Two people who are kept apart by the standards of their time, but also by the very forces of Love and Death themselves. It is a heart achingly beautiful story and one that reads like a song, which is apt considering how prominent music is in the book. There is a flow, and a rhythm, and a poetry to the prose. They echo the very beauty and ugliness of life itself. Thanks to Lola, whose glowing review made me want to read this book! Review to come later today. I did not feel the feels sadly. It was well written & engaging but I never came to care about the characters or how the game played out. Well now that you mention my favourite book, I have to pay attention. Not to mention that Elizabeth Wein loved it. It was romantic at times. But oh GOD how sad it is. Just just wayy to sad for my liking. Still 3 stars cause its a good story just not one I will be rereading or anything. Synopsis: Two teenagers are forced to play a game they never wanted to be a part of, where they must either fall in love or succumb to their deaths. And you thought The Hunger Games was vicious. Is This Just a Game? : The game that the title alludes to is alternately a rather simple premise yet at the same time very vague: Love and Death choose two players, seemingly random people with just a flick of their dice. They must either choose Love (fall in love with each other), or Death (they die). From Antony and Cleopatra, Romeo and Juliet, Helen and Paris, Death has always won. And now they have their sights set on Henry and Flora, two teens from Washington and two completely different worlds. While outwardly, the premise of the game is rather simple, the author just didn’t give a whole lot of other information to go along with it. Like, how do they choose the players? Are they chosen for Love and Death like an assignment, or is it seemingly random and at whim? Whom controls whom? There’s also implications that Love and Death are responsible for some of the seemingly major world events that happened during that time period. But if they’re implying that Love and Death are only responsible for bringing relationships together and tearing them apart, why would they get involved in anything else? It was all rather vague and made a seemingly rather simple game maddingly complicated. Doomed Lovers: My heart ached for Henry and Flora. Henry is Love’s player and is the adopted son of a very white family. Flora, Death’s player, is an African American girl who dreams of becoming a pilot, but for now must be content with being an airline mechanic and nightclub singer. If it had been a different world, they would have ridden off into the sunset. But being that it’s 1930s America and desegregation has not yet come into affect, their relationship is all but doomed. They had so much against them, and yet I couldn’t help but root for them as a couple. Henry is the idealistic romantic to Flora’s more realistic, logical temperament. She wakes him up to his privilege and he helps her realize that maybe their love is worth fighting for, even if they might lose in the process. They’re a ship worth boarding. The Puppeteers: Love and Death themselves were some of the most interesting characters of the book as a whole. They’re almost like a brother and sister who barely tolerate each other but care about each other in their own weird way; frenemies, so to speak. Their tense dynamic made their chapters all the more interesting to read. You could clearly tell that neither really relished the roles they were assigned to perform, and will go to any lengths to win. Death is particularly brutal in her hand of the game, though one might argue that Love wasn’t much better, though he manipulates emotions rather then actual events, like Death does. More backstory about them would’ve given greater insight to who they were and what they really are, rather then the vaguely fleshed out yet vastly interesting characters they are. The Pawns: The book deftly explores societal problems that the 1930s was facing, particularly racism and homosexuality. Ethan is Henry’s adopted brother who also happens to be secretly in love with him. That unrequited crush quickly dissipates with the arrival of James, a charismatic young man who is a leader in a new Hooverville town that’s popped up in Seattle. He, with Love’s help, manages to show Ethan that his homosexuality is nothing to be ashamed of. Honestly, I would have been just as happy if this book were about Love and Death choosing Ethan and James to be their players instead of Henry and Flora. However, their romance, while present, is overshadowed by Henry and Flora, and furthermore, seems to be more of a physical relationship than an emotional one. I suppose I should probably be happy that it was included and done with as much sensitivity as it was, but man, I would have liked more scenes with them about their actual romance. It felt more like Ethan was just another pawn in the game than anything special that was happening between him and James. 3 1/2 stars , review coming shortly! "We do not choose whom we love...We can only choose how well." Despite the premise being great and the characters of Love and Death being sentient and talking bei "We do not choose whom we love...We can only choose how well." "To be written into story. That was how even the lost lived on." I was expecting a quirky read, I thought this was going to be a Neil Gaiman-esque story but I was fooled. Love and Death reminded me of Crowley and Aziraphale from Good Omens at first but then I realized they were plain and two-dimensional. They were too human and not moved by any motivation at all. The author could have explained the Game better, could have narrated previous ones, instead she spared us the awesomeness of a backstory. She threw around names such as Romeo and Juliet, Antony and Cleopatra and we just had to settle with them. Plot-wise nothing interesting and believable happened, still I found the book way too long. The writing though was great and that's what's making me so angry about this book having not lived up to its expectations. It could have been so cool but, for me, it just fell flat. If you have ever listened to me about a book, listen to me about this one. It's easily one of the best books I've ever read. Justina Chen compared it to The Book Thief, and that's a worthy comparison. It's one of the only other books I can think of that shattered my heart as completely as this one did. Like The Book Thief and like most of the absolute best books, it's best when you go in with as little pre-knowledge as possible. It's not that there's a twist here (it's not We Were Liars) but this If you have ever listened to me about a book, listen to me about this one. It's easily one of the best books I've ever read. Like The Book Thief and like most of the absolute best books, it's best when you go in with as little pre-knowledge as possible. It's not that there's a twist here (it's not We Were Liars) but this book is absolute magic and I don't want anyone to have any of that magic spoiled for them. So yes, the summary above is short and doesn't tell you much, but that's okay. Because here's what you need to know: this book is perfect. It's absolutely amazing. It's the best book I've read in a long time---and I read A LOT. I LIKED: the idea of the Game itself; the complexity of the characters of Love and Death; the setting in 1930s Seattle; the way issues like race and sexuality were incorporated and handled in the story; some twists and turns I totally didn't expect and that threw me off. I DISLIKED: Henry's cheesy and over the top declarations of love and the way he threw all of his former life away way too quickly when he met Flora; the ending and particularly the way a certain's character's fate (vi 3.5/5 stars!